In this album, browse through images of my lovely brides and other clients. 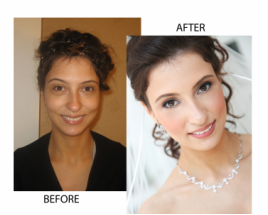 Some brides opted for airbrush makeup while others went with traditional. Most choose to add false lashes for an extra lush look, while some choose to go with their natural lashes but with a few coats of waterproof mascara. Dewy of matte, airbrushed or not, they looked gorgeous and the makeup lasted all night! Before and After photographs of past brides, bridesmaids, Maids/Matrons of Honor (MOH), Mother's of the bride (MOB) and other clients. Preview some of my commercial media work. Some of these images are from bridal look-books and printed catalogs. Browse celebrity clients, red carpet event make-up and press clippings as well as published magazine editorials. My work has been featured on MTV, VIBE Magazine, Hip-Hop Weekly Magazine, British Vouge, Italian Glamour, New York Magazine, New Jersey Health & Beauty, Comcast, and more.